Based in Germany, Continental AG (Continental or “Conti”) is a leading manufacturer specializing in automotive systems and tire production, and is the fourth largest tire manufacturer in the world. Conti manufactures bike tires for a wide range of riding conditions and applications. 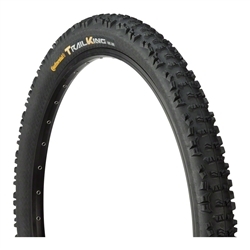 Their tire designs address the specific challenges of each riding application using special, weather-specific compounds and tread design specifications. Materials choices include Black Chili compound for outstanding grip and low rolling resistance. Construction specs offer a dense, central tread for smoother rolling and outer knobs for exceptional cornering traction. Popular models include Mountain King, Trail King, Super Sport Plus, Grand Prix and Gatorskin. Recognized for their durability, the entire Conti line-up is unmatched in their puncture-proof construction of cycling tires. We like quality of a Conti tire. They feel substantial in your hand, with a nice heft to them. Below the subtle tread pattern inspired by the Grand Prix race tires, is a super-tough layer of specialty rubber that Continental claims is nearly impenetrable. They may require a little extra persistence to get on your rims, but you won’t take them off any time soon.